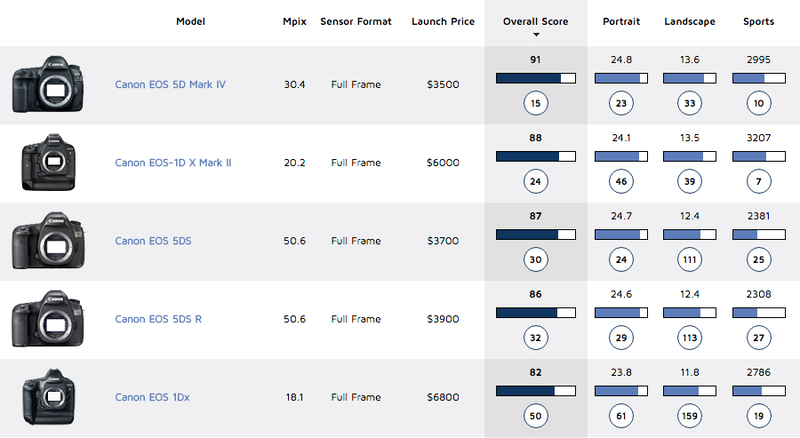 Achieving an overall DxOMark sensor score of 91 points, the EOS 5D Mark IV becomes the highest-ranked Canon DSLR in our database. Pushing the EOS 1D X Mark II down into second place, the 5D Mark IV boasts slightl- improved results for both Color Depth and Dynamic Range over Canon’s flagship DSLR. The sensor in the pro-grade EOS 1D X sports camera remains marginally ahead for ISO sensitivity, but not by much, and considering the 5D Mark IV’s beefier 30.4Mp resolution, that’s an excellent achievement. With sensor scores of 24.8 bits (Portrait), 13.6 EV (Landscape) and 2995 (Sports), the 5D Mark IV has improved in all of the metrics compared to the 5D Mark III. The most notable improvement is its dynamic range score (Landscape 13.6 EV), which offers nearly a 2-stop advantage over the 11.7 EV recorded on the 5D Mark III. Canon enthusiasts will certainly welcome this, and combined with the big resolution bump over the previous model, the 5D Mark IV looks like a very worthwhile upgrade for image quality alone. All course those headline scores are recorded at the 5D Mark IV’s base ISO, so how does it fare as sensitivity increases? For print results, the dynamic range holds up pretty well, offering similar levels at ISO 1600 compared to the 5D Mark III at ISO 100 – 11.46 Ev vs 11.7 Ev. In fact, Dynamic Range doesn’t drop below a good score of 10 EV until ISO 6400, and although at the expanded 51,200 and 102,400 ISO sensitivities it drops down relatively low, at the highest native ISO of 25,600, it’s still a respectable 7.83 EV. Color depth remains above an excellent 20 bits up to ISO 1600, with good color over 17 bits at ISO 6400. At the top native ISO 25,600 setting, as well as at the expanded sensitivities, color drops to around 14 bits or below, however, so expect a noticeable loss of color at these settings. Signal-to-Noise Ratio (SNR 18%) for RAW files is excellent up to ISO 800, scoring above 37 dB, and good up to ISO 3200, scoring around 32 dB. Above that, noise starts to become more prominent in RAW files, but with some manual noise reduction in post-production, or with the 5D Mark IV’s Digic 6+ processing engine’s good JPEG conversion, respectable results up to the top native ISO 25,600 should be possible. Taking all that in to account, the 5D Mark IV is capable of recording very high-quality images with good dynamic range, color sensitivity, and minimal noise up to ISO 3200, or ISO 6400 at a push, rendering a RAW image file with plenty of scope for adjustments in post-production. While DxOMark sensor score improvements were modest between Mark II and Mark III, the Mark IV boasts significantly better image quality in all areas over its predecessor. Color depth has increased a half-stop at 24.8 bits compared to 24 bits; dynamic range increases by a massive 2 stops — up to 13.6 EV compared to 11.7 EV; and ISO improves around half a stop at 2995 ISO compared to 2293 ISO. Both the Mark II and Mark III offered similar results for Dynamic Range between ISO 100 to ISO 800, only dropping from 11.7 to 11.1 EV. The Mark IV doesn’t manage to achieve this, with a steeper downward trajectory for dynamic range as sensitivity is increased, although obviously it’s starting at a much higher level. So that two-stop advantage at base ISO is reduced to one stop at ISO 800, with scores of 12.1 EV for the 5D Mark IV and 11.1 for the Mark III. The gap narrows further at higher sensitivities, too, but despite this, the Mark IV remains ahead at all ISO sensitivities. It’s a different story for color depth, however, where image quality between the Mark IV and Mark III remains consistent as sensitivity is increased, with the Mark IV maintaining around a half to two-thirds of a stop better color at all ISO settings. SNR scores between the Mark IV and Mark III are almost identical to the Mark IV version, just picking up a little bit at higher sensitivities over ISO 1600. Bearing in mind that the 5D Mark IV is doing this with around 8 million more pixels on the sensor and therefore a reduced pixel pitch, we can say Canon has improved the signal-to-noise ratio on the latest 5D model. With overall DxOMark sensor scores of 97 and 98 for the Nikon D810 and Sony A7R II, respectively, compared to 91 for the 5D Mark IV, Canon has certainly caught up with the competition, but remains behind the top sensors in Sony and Nikon cameras. The Sony A7R II offers over two-thirds of a stop better color (26 bits compared vs 24.8 bits), but only marginally better dynamic range (13.9 EV vs 13.6 EV), thanks to the big strides forward Canon has made in this regard. The Nikon D810 remains the king of dynamic range, however, with its class-leading Landscape score of 14.8 EV — over one stop ahead of the 5D Mark IV. The D810 achieves this at ISO 64, however — a sensitivity that doesn’t exist on the A7R II or the 5D Mark IV. So while the Nikon sensor is well ahead at its base ISO, its advantage at ISO 100 is reduced to around two-thirds of a stop over the 5D Mark IV, with scores of 14.3 EV vs. 13.6 EV, respectively. At ISO 200 and 400, all three sensors offer the same dynamic range; but interestingly, at high sensitivities the Canon 5D Mark IV jumps ahead of the D810 to offer around two-thirds of a stop greater dynamic between ISO 1600 and ISO 51,200. The 5D Mark IV is not quite as good as the Sony AR7 II at these higher sensitivities, but it’s not far off and certainly offers comparable results between ISO 200 and ISO 1600. Where the Sony does excel is color depth, where it maintains a fairly consistent advantage over the Canon and Nikon competition up to ISO 6400. The D810’s advantage for color diminishes against the 5D Mark IV as ISO is increased, with both sensors offering very similar scores from ISO 800 and above. The Sony A7R II actually improves, relative to the competition, as sensitivity increases, achieving slightly better color depth at ISO 3200 compared to the Canon and Nikon models at ISO 1600. This advantage for the A7R II is significantly reduced at the top ISO settings, however, with more comparable color depth results between the three models at the top native ISO 25,600 setting. 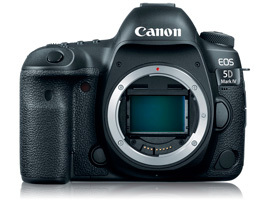 Canon enthusiasts and pros alike have been chomping at the bit for the latest upgrade to the 5D series. For stills photographers, the EOS 5D Mark IV doesn’t disappoint, boasting an array of enhancements to the autofocus, metering system, and resolution, as well as adding intriguing new features such as Dual Pixel RAW mode. Carefully balancing resolution, features and body design, the 5D Mark IV sits nicely in the current Canon DSLR range between the 14fps / 20.3Mp EOS 1D X Mark II professional sports camera and the super high-resolution 50Mp 5DS / 5DS R models. What’s more, the significant sensor improvements over its predecessor in both resolution and dynamic range makes the new 5D Mark IV look an attractive upgrade for Mark III owners shooting weddings, events, landscapes, editorial and advertising work, as well as for photographers stepping up to their first full-frame camera. With an initial $3500 price tag (body only), it’s a little more expensive compared to the $2,800 Nikon D810 or the $3150 Sony A7R II competition, but that’s less significant if you’ve already invested heavily in Canon EF lenses. Further, with the EOS 5D Mark IV, you get an awful lot of camera for your money, including a sensor that boasts the best DxOMark sensor score to date for a Canon DSLR.